This pattern features four fast and fun “in-the-hoop” embroidery projects, great for gifts, or just to have around your home to show support for your favorite team! 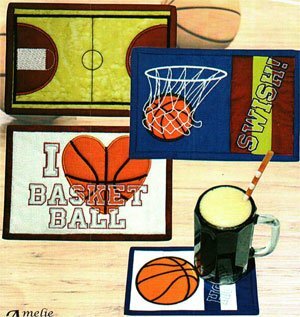 Our Basketball Mug Rugs pattern includes four designs: a basketball, a SWISH basketball hoop, a basketball court, and an “I heart Basketball” design. Use your team’s colors in the fabric and threads. Basketball Mug Rug projects take about an hour to stitch out. The pattern includes digital embroidery files for all major machines, step-by-step instructions with photographs, and bonus applique designs that you can use on other projects. An embroidery hoop with a 5.5” x 8” stitching field is required.